This semester I’m taking Yasser Ansari’s Understanding Genomes class. 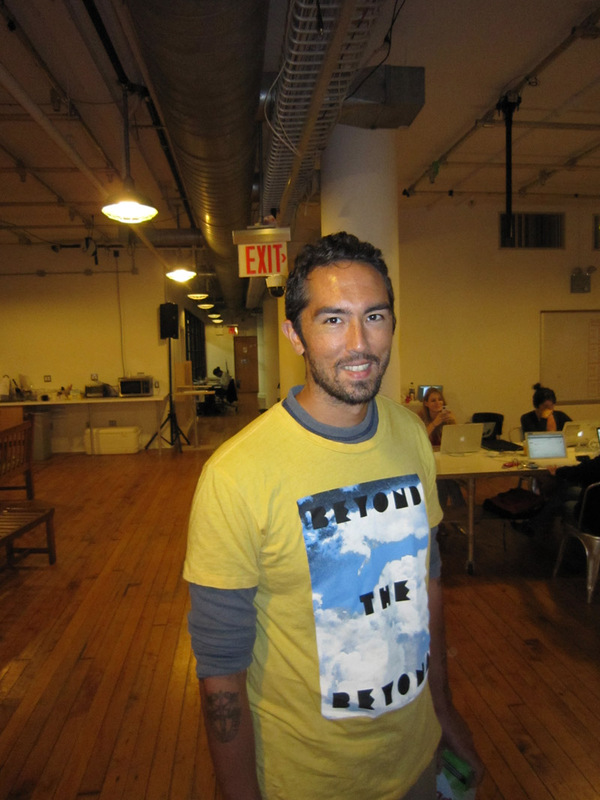 Professor Ansari is a co-founder of Project Noah, which lets mobile users become urban citizen scientists, taking photos of flora and fauna to post online for identification, unlocking badges, helping kids learn in class, etc. We’re already reading the biopunk manifesto and James D. Watson’s book The Double Helix, about his and Crick’s Nobel-winning discovery of DNA’s helical pattern. We’re also getting to use Lore, which has emerged as a more ajaxy user-friendly, minimalistic-looking alternative to Blackboard and its competitors. Last week we made online dating profiles using different model organisms to learn about why they’re used, how many base pairs they have, etc. 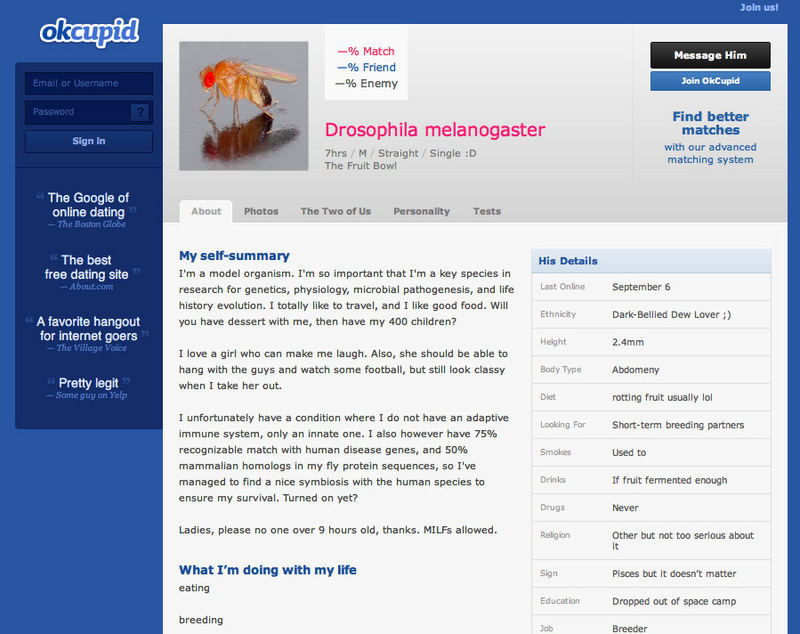 My model organism was the fruit fly (Drosophila melanogaster); here’s the Okcupid profile. 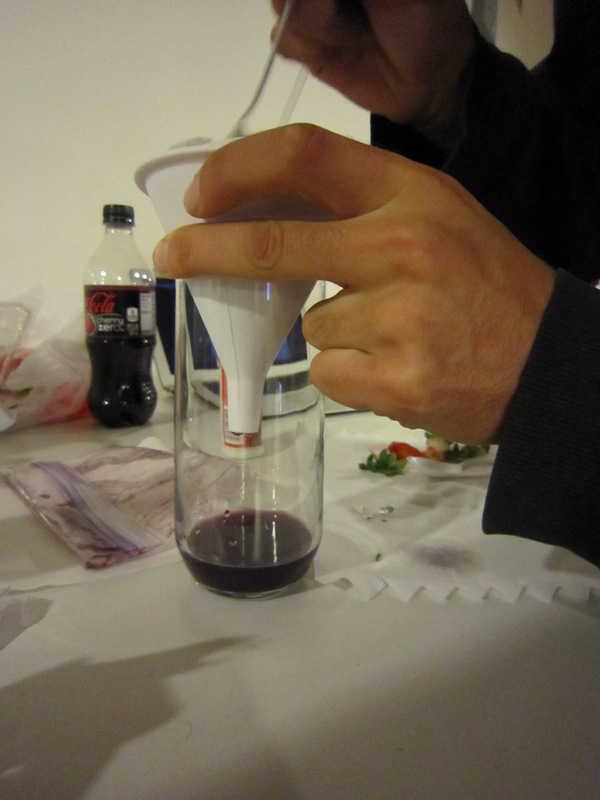 In this exercise, you will extract DNA from strawberries. Below is a list of materials along with a protocol courtesy of Genspace. Document the process and pay attention to the procedure so we can discuss your experience in class. Feel free to work in groups and share materials. Read through the materials and protocol before you start the experiment. Contact me if you have any questions or concerns. 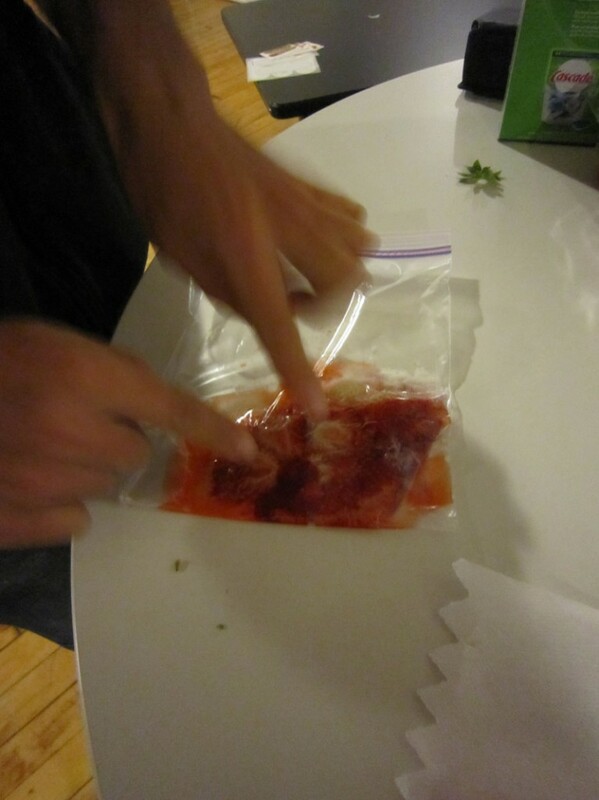 Step 1: Place the strawberries into a ziplock baggie. Step 2: Add the detergent, meat tenderizer and salt (again, don’t use too much salt). 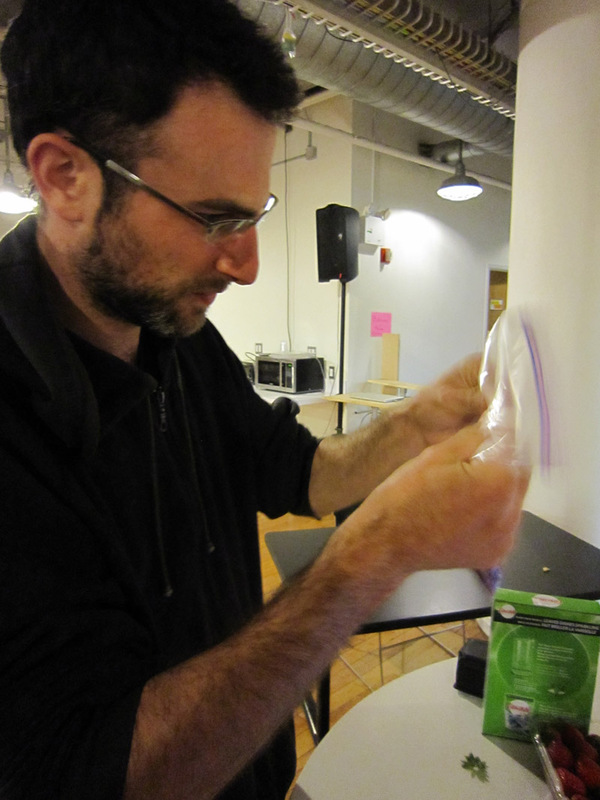 Step 4: Open the baggie and add a little bit of water. Shake it up a little. 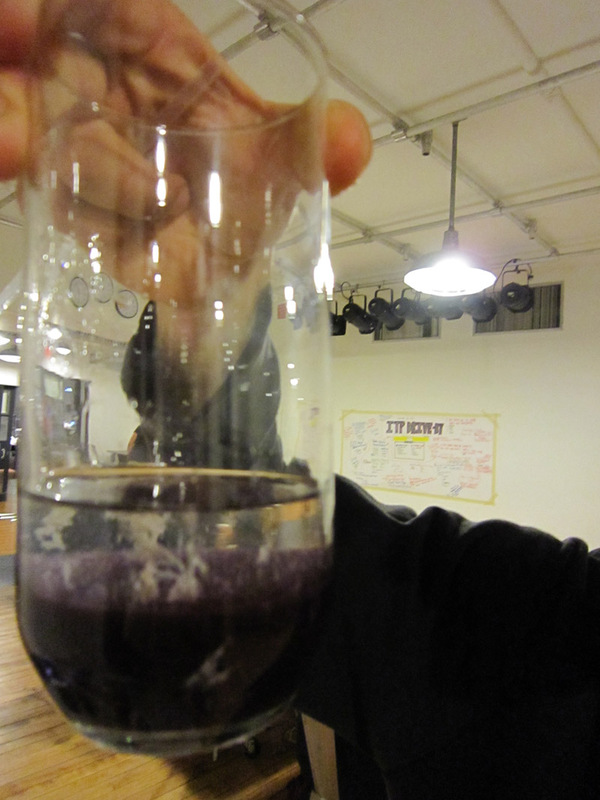 Step 5: Place your filter in the funnel and place this in the glass. 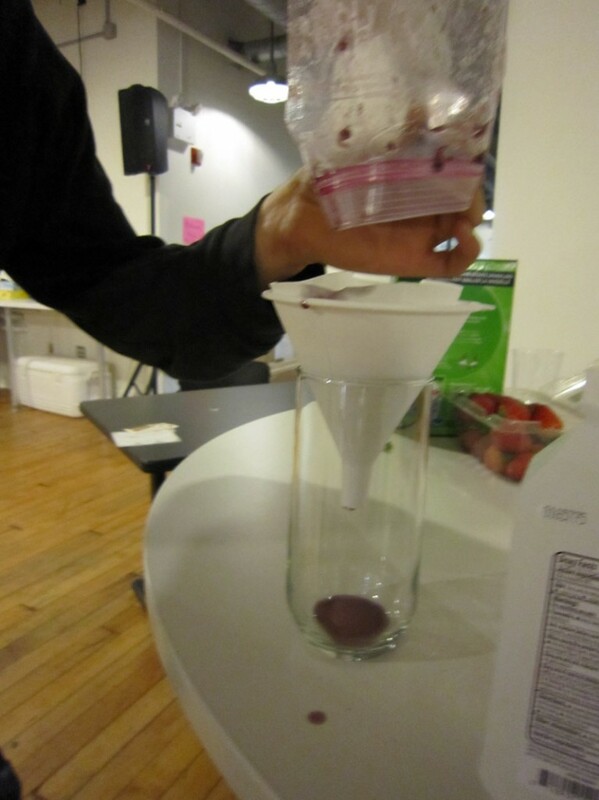 Now pour the contents of the baggie (the strawberry mixture) into the filter. 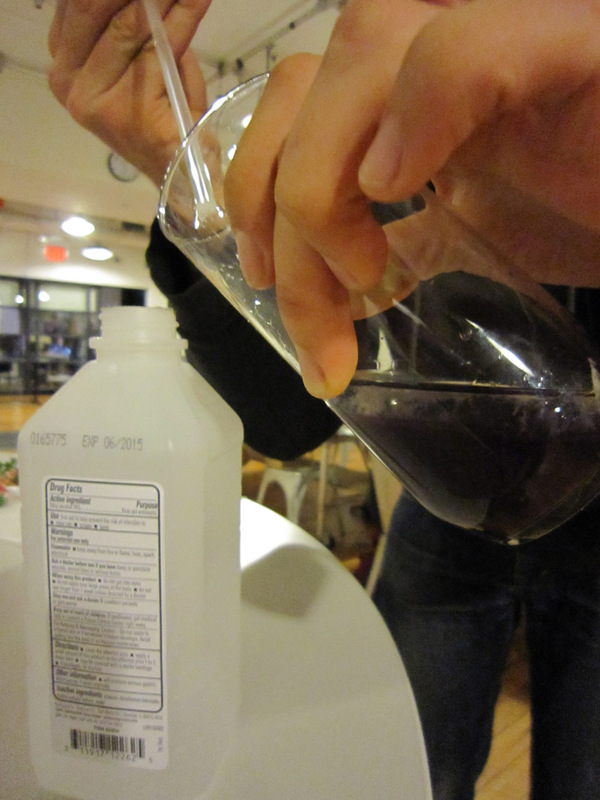 Step 6: Let the contents drip through the filter into the glass. It should look milky pink. Be patient! If the filter is working too slowly, you can gently squeeze it, but not too hard or it may break. Step 7: Holding the glass at an angle, very slowly pour the chilled rubbing alcohol down the side into the strawberry mixture. You want to pour it slow enough so that a layer of the clear alcohol forms on top of the pink layer underneath, since the alcohol is less dense than the water layer containing the strawberries. If you pour too quickly you won’t see this layer form, so remember to do it slowly. Pour enough alcohol so that you have at least a 2 inch layer on top. Step 8. Now set your glass down. 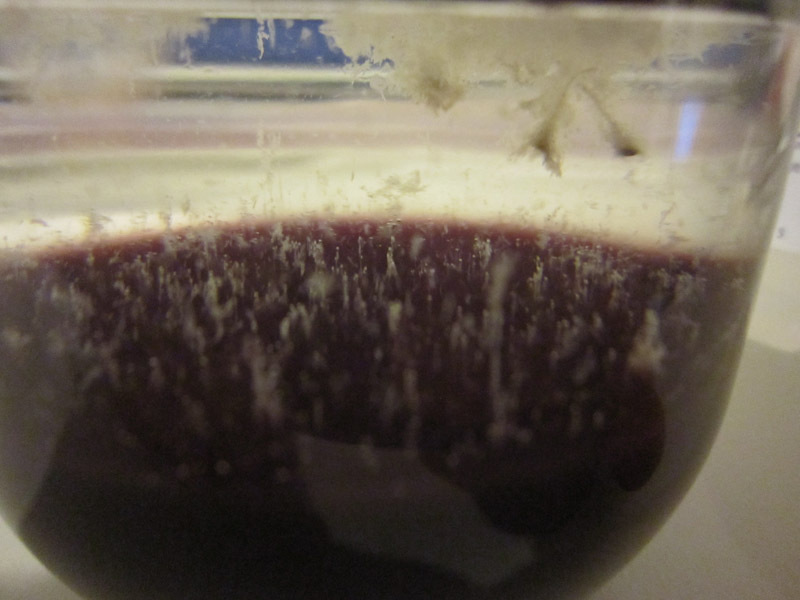 You should start to see a wispy white layer start to form between the bottom pink layer and the clear alcohol on top (like the photo shown in class). It should take about a minute or more to develop. It will start to look like a small ball of cotton. Sometimes it looks like many small pieces of cotton. Give it some more time and it will gently rise to the surface. 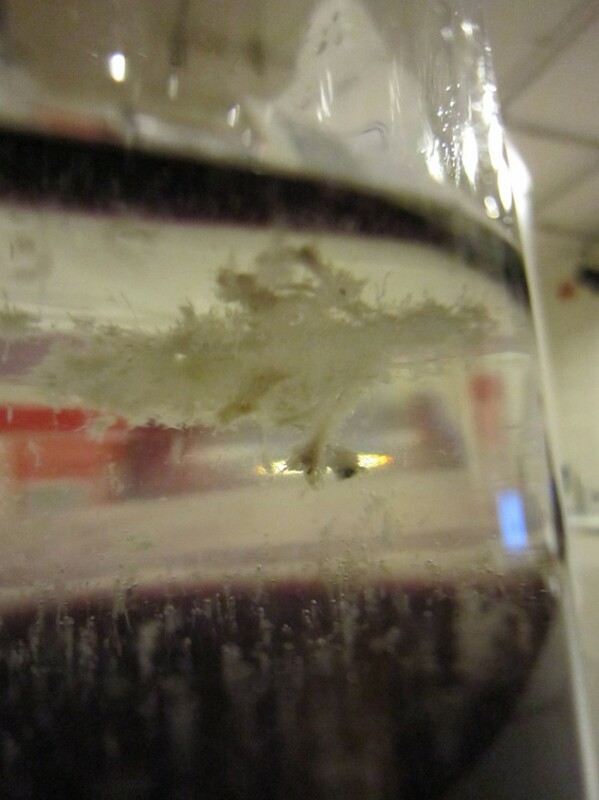 This is the strawberry’s DNA starting to precipitate! Step 9: Using your thin wooden stick, you can now fish out the DNA. It will be rather “stringy” since DNA molecules form long chains. These types of molecules are known as “polymers”. What’s the table salt for? Meat tenderizer, what’s that for? Phil, who dropped the class, wanted to do this homework with me anyway (we’re such a good pair) so we worked on it Monday night. 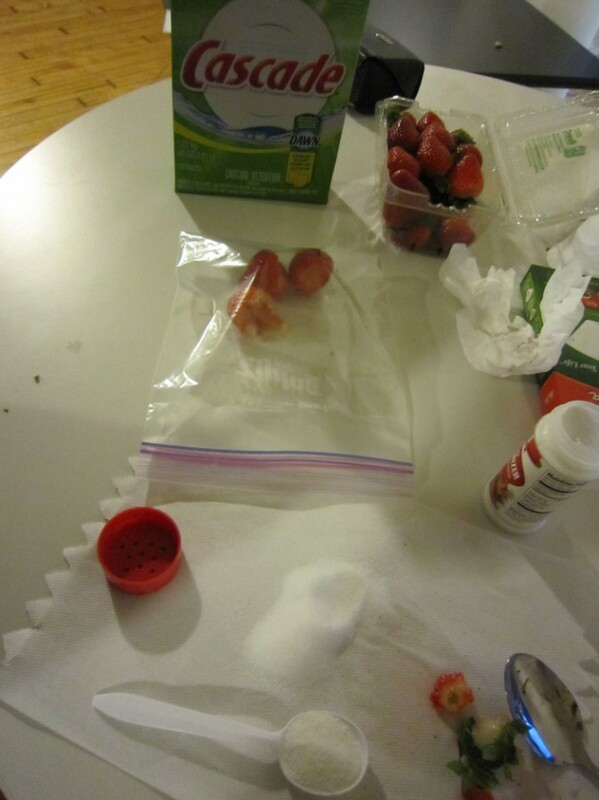 Prepping the strawberries with salt, meat tenderizer, and detergent.